I have a parcel coming - nothing that important, but I was hoping to have it Friday, and indeed it should have arrived Friday. However, it was not guaranteed, so I'll let them off with that. On Saturday I got a card. This was odd because I was at home most of the day and James was at home all day. The postman clearly did not knock. The card states that the item is "being held safe at the local office, ready to collect the next working day" and lists times, including today (Sunday) as a working day 10:00-14:00. I went to collect - it took half an hour even though only two people ahead of me, one of which was told they could not find his parcel! I was told the item is not back at the depot. They say the card was left at 14:45, and the office closes at 15:00 so probably on the van still or something, and tough! This is odd - as the card was left long before 14:45, and the card clearly shows the office was open until 17:30 on Saturday, not 15:00, so clearly I am being told lies. Indeed, so far I count 4 lies from the Royal Mail, and a waste of over half an hour of my time. What is the deal with ID? Normally the only credentials you need to accept a delivery, even if signed for, is to be in the right place at the right time - i.e. at the door when the postman arrives. There is no check of ID or even name, just that the item is handed to someone at the address. But when collecting you need ID. Well, if you did not have the card I could understanding wanting some proof that you are someone living at that address, such as a driving licence matching photo and address. But when you have a card, the mere possession of the card proves you were in the right place just not at the right time. Had the postman arrived at a different time they would have been happy to hand the item to you. So why even check ID if you have the card. What is also weird is they want to check your name, not the address. Normally your name is irrelevant, when delivered in person. No check is made on name. So you would expect that an ID showing a matching address is all that would be needed. But no, they want to check name, and do not care if address matches. Also a bit odd what ID they accept. 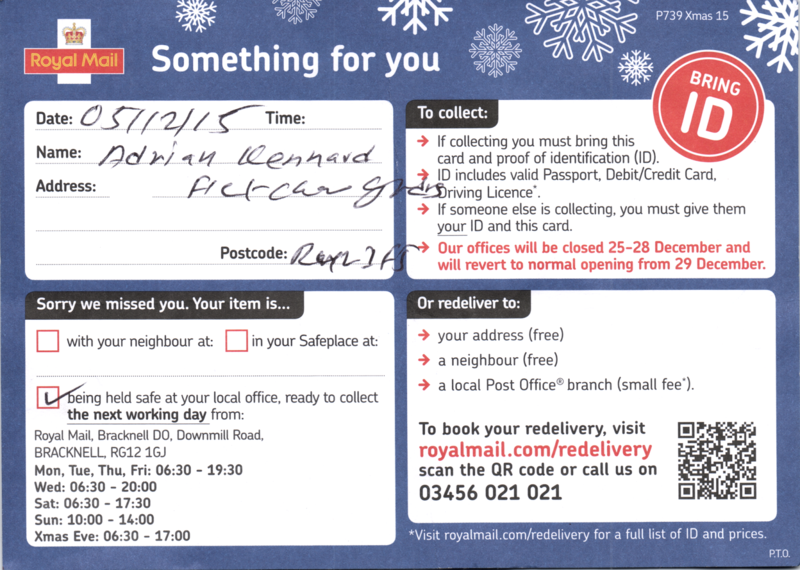 The card says the full list of ID is on royalmail.com/redelivery which is only true if you are not accessing from a mobile, as the mobile site does not list ID types! Passport and driving licence, being official documents, I can understand, but bank cards - they are just issued by a company, so why not any old company ID card. I did not get to try my company ID (which was accepted by the Home Office even) because they did not actually have the parcel. I'll try tomorrow. Don't expect Royal Fail to make any sense. They won't under any circumstances give you your parcel if you don't have the magic little red card, no matter what ID you have. And they're quite happy to give you someone else's package if you have their ID - they even tell you as much! 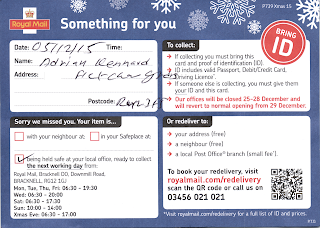 They often seem to deliver the card instead of bringing the parcel - that is really odd. It means the postman doesn't have to carry so much, which makes it quite a lot less odd. i.e. lazy postman syndrome. Also, a postman or other courier is usually paid for doing the deliveries on a certain set of streets, not by the hour. If he gets finished early, he gets more time off. Putting a card through a letterbox is quicker than ringing the bell and waiting. I once had to chase a DHL deliveryman down the road – I'd been sitting by the front door (waiting for a book contract), and he slipped the card through and took off. If he hadn't had to stop and unlock his van he might have made it. I've picked up for my wife a few times.. most of the time they don't check ID even though it's clearly not for me. When they do they're happy with ID with my name on it. So they're not really checking in any effective way, just using the cards mainly. Derby office is even a bigger joke, you have to wait 48 hours and hours hey still don't have your post. They are probably dealing with all the TV PO box post rather than dealing with real customers! I must read what autocorrect mangles my rantings to more often as that does not make any sense! Ah another stealth delivery, where they sneak up to the door and quietly slide the card in because they can't be arsed doing any work. I had exactly that about two weeks ago now - saw someone walking towards the door, so headed towards it myself, expecting it would be a parcel I'd have to sign for, so I actually watched as the "we lied about trying to deliver..." card slid quietly through. Until I looked more closely, I assumed it must have been a takeaway menu! A few years ago it reached new depths, though. My mother went to collect a parcel - which they had lost. They had no idea what it might be, who had sent it or what had happened: all they knew was that they had lost it. With no information about the parcel, that had to be the end of the matter! Last month, I ordered something by their "24 hour" service. The next day, they emailed to confirm it was in my local delivery office (1 mile away!) and would be "out for delivery today". Two days later, it actually showed up at my door. I emailed to complain about this, and was told it wasn't a guaranteed 24 hour service, that's just a target they completely ignore and lie about. They accepted my company ID card without me even asking, he saw it on my lanyard. Yeah the post office seems to be responding to increased competition from other delivery services by becoming less and less helpful... Unfortunately it's usually the sender of a parcel that chooses the service, and they have little incentive to choose based on the quality of service. Not as bad as Citylink. On one occasion I was waiting for a parcel, heard the van pull up outside, and watched through the window as the driver walked to the front door, posted the card, walked back to his van, and then drove off. That prompted a complaint to the company that had chosen them as delivery service, and while it may have taken some time (and other people's complaints) they have now switched to the exceptional DPD (the company that lets you GPS track the van online, and gives you a 2 hour delivery window, so you don't experience Murphy's law while in the toilet, when waiting all day). My current problem though is that I live in a flat at the rear of the property, and there is no signage or intercom to help a delivery-person find my front door. I end up paying for next day, only to have my landlord not be in to sign at the building's front door, and having to pick up parcels from the post-office the next available wednesday or saturday. I wish there was some kind of law requiring residences to be findable without having to add lines to my address (that would cause all kinds of trouble when it doesn't match the one for my debit card). On the bright side though I am no longer bothered by political campaigners, door-to-door salesmen, or Jehova's Witnesses, like I was in my last flat. What if someone posts something to your pet?